People are dumb, but like to think they are not. They will get frustrated with things they do not have the patience to learn, yet will yell at you for making something "too simple" for them to use. And yet the "too simple" thing is the only thing they could use without getting vocal strain, a bad attitude, and a sparking hunk of plastic and silicone. When I first got my Razer, or however you spell it, I knew how to use it with no confusion. When an elderly friend of mine recieved the same phone, it was no more. Boy this "Silent D" Person has been sending you a lot of links, I bet he is awesome..
That's a half truth, you may want to note that mobile phone companies have no hearts and are dedicated to making you as miserable as possible. i mean if i ran over some kid, i couldn't say "oh i don't know how an internal combustion engine works so it's not my fault, sorry about the kid" because the cop would laugh at me for doing that and even trying to use that as an excuse. 1. All of you, stop. You're being ageist. If its so obnoxious, why should the consumer be the one to have to try and get the thing to work? Just because you've grown up with technology, doesn't mean that all people have a natural nack for figuring out how to use it. Anyway, most phones are too complicated. I know how to use my Moto Q, but it is so nonsensical. I mean, why is it that whenever I want to do anything to the alarm, I have to go through Five menus to get to it? Or to set an appointment in my phone's calendar. Four. I'm sorry, but why should I use my phone's things if I can use my actual calendar, whose only menu is the cover of the booklet, or an actual alarm clock, which is universal and standardized? My mother just got an instinct and, my fellow Escapees, that is a well-designed phone. To her, its the first phone she's ever had that makes any sense. And I agree wholeheartedly. "Dang nabbit Judith, these darned cordless doo-hickeys are just too troublesome"
I have the perfect phone, apart from connecting to the internet, it does everything a phone should, and nothing a phone shouldn't. Pretty much summed it up dude. Uh huh. Most people simply want a phone and texting device anyways. Not that many people really care about internet on their mobile phones. Fact is, things can be complicated, yet easy to use and mobile phones are not. Like Erana said, technology should be easier to use as technology improves, not the other way around. You're forgetting the part where technological advances allow greater functionality in a single device. Do you really want to carry an alarm clock around with you all day, in addition to your day planner, and whatever other accessories you'd need to command the same functionality as the features available in a cell phone these days? You need context menus, and submenus unless you want a device that is littered with buttons that are individually hardwired to each function. Would you like a phone that comes with 40 buttons? It's a variation on what I said earlier, people don't have the patience to learn new things when they don't think they need to. As is the case with emerging technology, you will always need to spend some time fiddling with it to learn how it works. If you can't be bothered to do that, then have the humility to stop bitching when you're given a phone with one button marked "call". My mom once payyed me fifty cents for every feature I showed her on her new phone, I made like fifty bucks. I can see the paperclip popping up... "Hey! I see you're trying to call Mary, the girl from the office, Would you like to also delete the phone log so your wife doesn't find it?" I can instinctively figure out how to do anything on any mobile phone even if I have never seen that make model or what ever before. That being said some of the menus on some of the phones my elderly relatives throw at me to do things for them are stupid and very unintuitive. 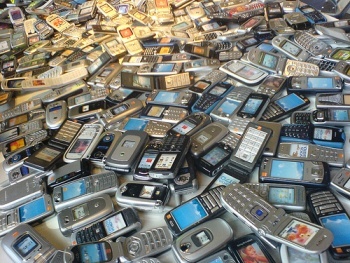 A lot of the motorola, samsungs come to mind. With some options being buried in layers of sub menus. Nokias tend to be very good, as does my viewty. But like it said it generally doesnt bother me although Im not in any massive rush to get a samsung or motorola as my next phone. Who is this Joe Public, and why is he so stupid? "Setting up a mobile phone should only take 15 minutes, according to Bancroft, but most users hack away at it for over an hour." I have an old phone and I'm not used to these new fancy phones with colours and stuff so I'd like to ask what's so hard in setting one up? Seriously? Ok, I still don't know how to get my PDA to accept mail, and I tried playing the XBOX version of Fallout 3 last night and it took me over an hour to find the inventory screen. I second that, I hate it when things are made too simplistic for the moron demographic, the phone runs on some pretty advanced technology now, if you don't like it, you can always use a telegraph. It's incredible how hard people it find to even understand simple mobile phone interfaces but also things like DVD players. Give me any portable device and I've got it figured out in a minute or immediatly. Ah well, I guess it's just a generation gap. I think perhaps a lot of people these days are a bit contrary to the "media centre in your hand" approach to phones these days. They want to call and text, and that's about it. They are not interested in all the extras so they don't bother finding out how to use them. I'm always a bit suspicious of these surveys because it doesn't show what kind of questions they were asking, nor the demographic interviewed. I wonder if it was all engineered to show this. I'm sure if I wanted to prove something to the contrary I could do it just by asking the right questions. The real problem is that we all know that technology makes things easier it is the mind set that the person had that makes using a smart phone or if they are new to cell phones complicated. I have to sell cell phones as my day job and sometimes it is like banging my head into a wall explaining the simplist of things that the consumer already knows. For example I had to explain how getting e-mail on their cell phone is the same as logging into their e-mail accounts. He already knows how to use the application but does not want to take the time to understand. I also get a lot of customers who want to get a smart phone but go to a standard phone because they say "it is too complicated". It is their choice of not wanting to learn that makes people claim that cell phones are too complicated. The only group of people that have my patience are the elderly and you have to be 70 years old to hit that mark. While I do not expect people to have cell phones growing up the basic knowledge of using a cell phone is a simple as using a home phone or any phone. Well I'd be lying if I said I hadn't had some of those problems, but that's not comparable to switching bank accounts (according to 61%). I'm actually going to learn how to install an operating system from the 1960s so that I can instantly rescind almost anyone's right to complain about technology being too difficult. Damn it, what is so bloody difficult about using smartphones? It's not like they're using command-line UNIX! The simple solution to the problems of a "too complex" phone (or anything for that matter)is: Read the manual. I am always surprised by how many people wont read the manual even though it only takes a few minutes.